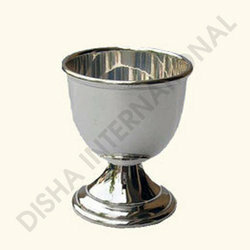 We are manufacturer and exporter of sterling silver and silver plated egg cups. We have many different patterns of egg cups available in silver and silver plated. Egg cups are very versatile gift for a baby at home or with any of your relations, friends or colleges. The above mentioned cup is with a beautiful Celtic border. With a firm commitment to quality, we are presenting for our clients a vast range of Sterling Silver Egg Cup. The offered egg cups are manufactured using ultra-modern technology and the best quality silver in line with industry set norms. In order to maintain the quality, our offered egg cups are strictly tested on diverse quality parameters. We provide these egg cups in various sizes and specifications in the market at affordable rates. We are offering customized products.